This undescribed case moth caterpillar seems to prefer feeding on monocots, particularly grasses and sedges and Chlorophytum. Recognised by the concentric rings of sticks or pieces of grass stem all of the same length. As the larva grows it adds another ring with a slightly larger radius. 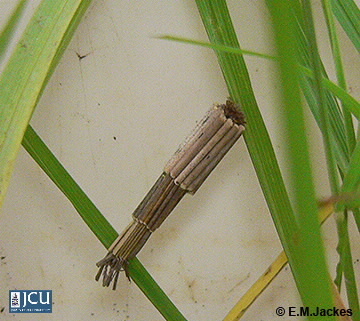 Specimens were up to 4 cm long and used sections of grass stems as their ’sticks’. One animal took about 6 hours to find, cut and attach a ring of ‘sticks’.